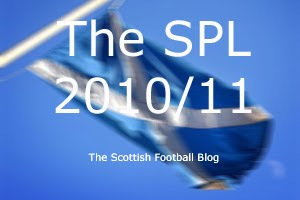 A warm welcome back to the SPL, a league to cheer the hearts of a nation wearied by the failings of their national team. Not sure which nation but there must be one somewhere. On a more serious note I think the international breaks that have topped and tailed the first three league games of the season have been badly timed. I know the calendar is crowded but the last three rounds of fixtures in the SPL have felt a bit phoney war-ish to me. Hopefully now we can get down to some proper business. And, jings, crivvens, it’s a Saturday sixsome for us this week. Unusual but reassuring in a traditional kind of way. We’ll start here. It seems the chronologically sound thing to do. I’ve heard a rumour that ESPN is offering viewers free access this weekend. So what better way to kick it off than sitting back, looking up your favourite pizza delivery service and enjoying the game. Obviously it might not be a classic game. But it won’t be like suffering a Scotland game. And right now that’s a positive. We’re still waiting for an Old Firm slip up in the SPL this season. Unfortunately for Hamilton I can’s see it happening here. Away win. “Ooh la la” sang The Faces, possibly inspired by this fixture, which has always seemed to throw up the odd cracker and a few moments of controversy over the past few years. How equipped are Hearts for what looks to be a wide open race for third? Can Celtic stand up to a real domestic challenge in these home games? It’s likely to a clash of styles, a new look Celtic fielding attacking players out to prove their reputation at home and Jim Jefferies looking for Hearts to defend doughtily and quick and incisive on the break. Intriguing. I’d not be massively surprised if Hearts nicked a point here but I think Celtic will edge it. Home win. The New Firm. Is it really that long ago that these two sides weren’t only jousting with the Old Firm for pre-eminence but actually looked set to build a dominance of their own? Are United and Aberdeen passing each other on very different trajectories this season? Maybe not very different, but United are likely to struggle to replicate last year’s success while Aberdeen should enjoy a more pleasant few months than they did last time out. It would certainly be a statement of intent if Aberdeen were to take something here. And I suspect they might. Away win. With six home defeats on the bounce the last team Hibs will want to face is an Inverness side that has had often had the better of these clashes. If this leads to a nervousness at Easter Road then Terry Butcher will be looking for his players to feed off and take advantage. John Hughes will be looking for his players to bounce back from the bad, bad performance against St Mirren a fortnight ago. I’ve a feeling this won’t be a classic. A draw might just leave both sides feeling a touch unsatisfied. Both dressing rooms will be ringing to cries of “more of the same” after both pulled off big wins last time out. Neither of these teams were, and I mean no disrespect, particularly fancied in the pre-season build up. So perhaps against Aberdeen and St Mirren they were able to bring an element of surprise to the game. I suppose more of the same might mean that they cancel each out. But I’m not so sure. Winning home games is a must for both. And I fancy Killie for the home win in this one. I’d like to think this one will fly under the radar a bit and turn into one of the games of the weekend. Two closely matched teams and plenty to admire in both. Not, perhaps, earth shattering starts to the season but a two week lay off might have done both, particularly, Motherwell a bit of time to regroup and focus on the challenge ahead. So I’m looking for a close contest, a good few goals and, at the end of it all, a draw. So far: 6 out of 18. It’s already looking like a long hard road to respectability.